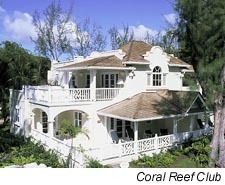 Ninety-nine percent of the best villas and hotels are situated along Barbados' west coast. Sandy Lane Hotel and Golf Club, which has been known world-round as a luxury resort since 1961, has recently completed a three-year redevelopment. The hotel provides everything one would expect from an ultra-deluxe resort. Bill and I were especially blown away by the resort's new spa. Bill called it a top-of-the-line Disneyland for adults wanting to stay healthy and "balanced." Along with every conceivable type of massage, facial and body treatment, the spa offers a Chakra therapy room with a heated marble plinth, a hydrotherapy room with an underwater massage bath, and a jet blitz room. We wondered about the jet blitz room; at first glance it resembles some sort of torture chamber where the unlucky find themselves on the receiving end of a high-pressured water hose, perhaps similar to methods used in crowd control. But we were reassured that this form of "therapy" is one of the must-haves in a spa that has everything. We were able to join Sandy Lane's Eric Mapp for lunch at Sandy Lane and we found him gracious, casual and informal. We had a chance to tour the Royal Pavilion and Glitter Bay hotels and would recommend both of these excellent properties without hesitation, but the real jewel of the island's hotels, hands down, was the Coral Reef Club. Set amid 12 acres of beautifully cultivated gardens, this family-run luxury hotel just could not be more relaxing or more beautiful. With only 88 rooms, it is considered one of the best small luxury resorts in the world. We joined the owners, the O'Haras, for a cocktail party Monday night and enjoyed their soft, elegant approach. Although no one could go wrong choosing any of these terrific hotels, there is one thing that the Barbados villa vacation provides that is simply unbeatable: the villa staff. Each villa has gracious, superbly trained staffs that take great pride in their homes. 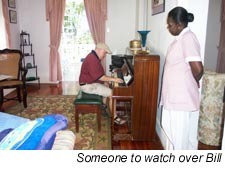 In some villas, staff members are part of a family that has worked at a particular villa for generations. Housekeepers and chefs can be as visible or as inconspicuous as you want them to be. Whether it's laundry, a four-course meal or just a chat about island life you're looking for, the villa staff is there to look after you. After several days of villa and hotel inspections we finally found a spare moment and headed into the island's interior, bound for the wild east coast. The impressive, old-growth trees found across the island not only provide shade along the shore but also act as host to an astounding array of tropical orchids in the island's interior. Barbados' mahogany and manchineel trees are the elms and oaks of the tropics and these trees - along with casuarina, traveler palms, ginger lilies and banana, mango, papaya and lime trees - provide shade on the grounds of many of the hotels and villas. Just north of Speightstown the roads thin out into spidery veins and the cricket pitches and golf courses give way to sugar cane fields and cow pastures. After crossing the island and passing Cherry Tree Hill we were struck by the sight of St. Nicholas' Abbey. Bill's background as an architectural historian came in handy as we took in the 1660's Jacobean plantation house with curved Dutch gables, chimney stacks and coral stone finials. Bill noted that the fine homes on Barbados, whether they’re 300 years old or five years old, are built in a solid fashion with no corners cut. The coral foundations and the year-round tropical growth make the new homes look as if they were established decades earlier. 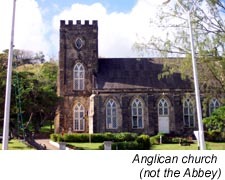 One can spot an intriguing old stone Anglican church in every parish on the island, the result of the island's British colonial history. When we arrived at the appropriately named village of Cattlewash we were greeted by the crashing surf and salt spray of the windward coast. On this side of the island there are more cows than people, and there's not a whole lot of cows at that. From Cattlewash the beach stretches north mile after deserted mile in a lonely, breathtaking grasp. Solitude and surf are the two tides that pull a few scattered souls to the east coast. 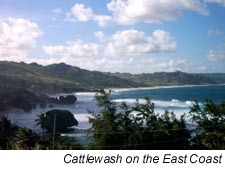 Bathsheba's "Soup Bowl" is a gnarly surf spot that draws world-class competitors during the town's surf competitions. Those lacking a master's degree in long boarding are advised to stick to the shore and enjoy the view. Traveling from the west coast beach life to the empty, open existence of the east coast is like traveling from one country to another, or from one time period to another. Standing near the huge boulders pounded by the relentless Atlantic surf, we looked east at the empty miles of ocean and felt centuries away from the beach life only 14 miles away.